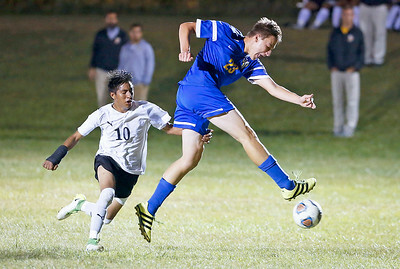 John Konstantaras - for Shaw Media Timothy Conner (9) from Johnsburg heads a ball in front of Daniel Robles Ibarra (4) from Harvard during the first half of their game on Tuesday, September 19, 2017 in Harvard, Illinois. 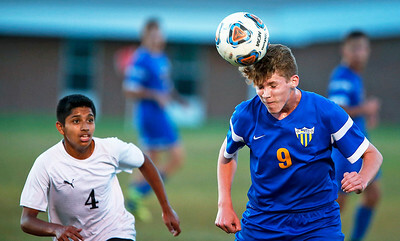 The Hornets defeated the Skyhawks 1-0. John Konstantaras - for Shaw Media Carlos Nova (24) from Harvard kicks a ball over Mj Alvarez (19) from Johnsburg during the first half of their game on Tuesday, September 19, 2017 in Harvard, Illinois. The Hornets defeated the Skyhawks 1-0. John Konstantaras - for Shaw Media Alexis Robles (center) from Harvard celebrates his goal with Marcos Cabrera (3) during the first half of their game on Tuesday, September 19, 2017 in Harvard, Illinois. The Hornets defeated the Skyhawks 1-0. 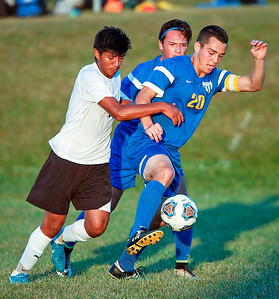 John Konstantaras - for Shaw Media Will Conroy (20) from Johnsburg works the ball around Noe Hernandez Reynoso (6) from Harvard during the first half of their game on Tuesday, September 19, 2017 in Harvard, Illinois. The Hornets defeated the Skyhawks 1-0. 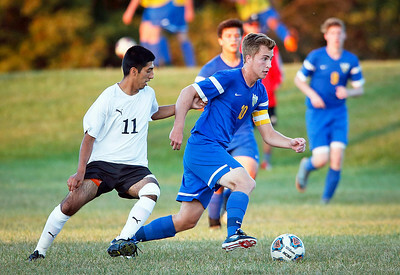 Dean Wiersum (10) from Johnsburg runs the ball past Gabriel Popoca (11) from Harvard during the first half of their game on Tuesday, September 19, 2017 in Harvard, Illinois. The Hornets defeated the Skyhawks 1-0. 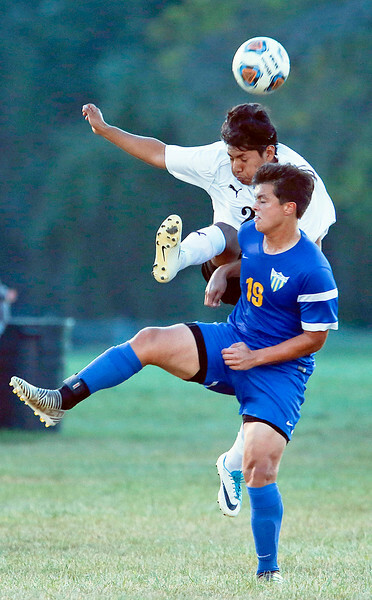 John Konstantaras - for Shaw Media Alexis Robles (7) from Harvard kicks a ball in front of Cody Dschida (2) from Johnsburg during the first half of their game on Tuesday, September 19, 2017 in Harvard, Illinois. The Hornets defeated the Skyhawks 1-0. John Konstantaras - for Shaw Media Brayan A. Sanchez (14) from Harvard and Cody Dschida (2) from Johnsburg battle for a ball during the first half of their game on Tuesday, September 19, 2017 in Harvard, Illinois. The Hornets defeated the Skyhawks 1-0. John Konstantaras - for Shaw Media Adrian Gorostieta (10) from Harvard grabs onto Mason Sobiesk (23) from Johnsburg as he clears a ball in front of his goal during the second half of their game on Tuesday, September 19, 2017 in Harvard, Illinois. The Hornets defeated the Skyhawks 1-0. 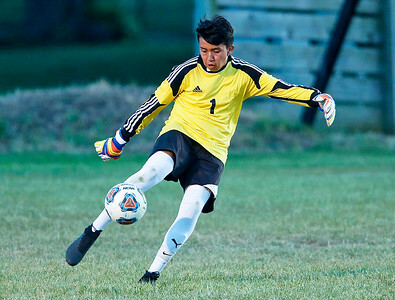 John Konstantaras - for Shaw Media Goalie Hugo Escobar (1) from Harvard clears a ball during the first half of their game against Johnsburg on Tuesday, September 19, 2017 in Harvard, Illinois. The Hornets defeated the Skyhawks 1-0. 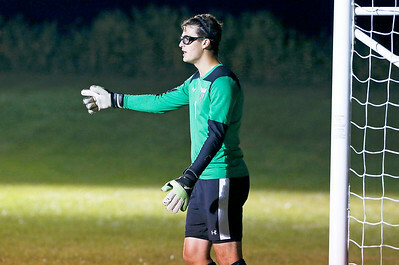 John Konstantaras - for Shaw Media Goalie Nicholas Craun (1) from Johnsburg during the second half of their game against Harvard on Tuesday, September 19, 2017 in Harvard, Illinois. The Hornets defeated the Skyhawks 1-0. 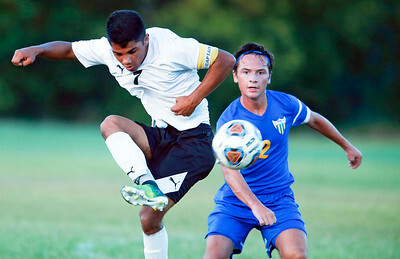 Carlos Nova (24) from Harvard kicks a ball over Mj Alvarez (19) from Johnsburg during the first half of their game on Tuesday, September 19, 2017 in Harvard, Illinois. 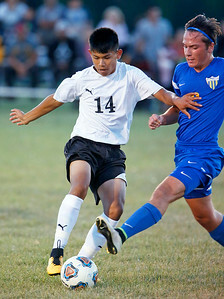 The Hornets defeated the Skyhawks 1-0.